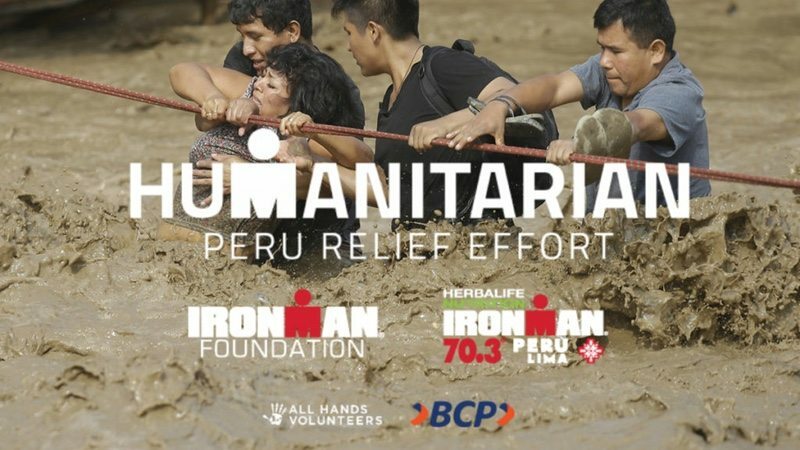 The IRONMAN Foundation and IRONMAN 70.3 Peru are partnering with All Hands Volunteers and Banco de Crédito del Perú to raise critical funds in response to the catastrophic and ongoing flooding in Peru. This season, more than ten times the usual rainfall in Peru has caused devastating damage. More than 90 people have lost their lives, while approximately 900,000 are displaced and 300,000 children are unable to attend school. IRONMAN 70.3 Peru will take place in Lima on 23 April 2017. The IRONMAN Foundation will match all donations made by race day, up to US$5,000 in total. Additionally, athletes who wish to volunteer to help rebuild the schools may register with All Hands Volunteers. This is the IRONMAN Foundation’s second initiative with All Hands Volunteers; in 2016, the organizations partnered to build a community centre in Manta, Ecuador as part of IRONMAN 70.3 Ecuador race week.